Sponsored by Frontier Communications, DISH Network, The Weather Channel and CoBank, America’s Best Communities aims to spark innovation and growth in small towns across the country. 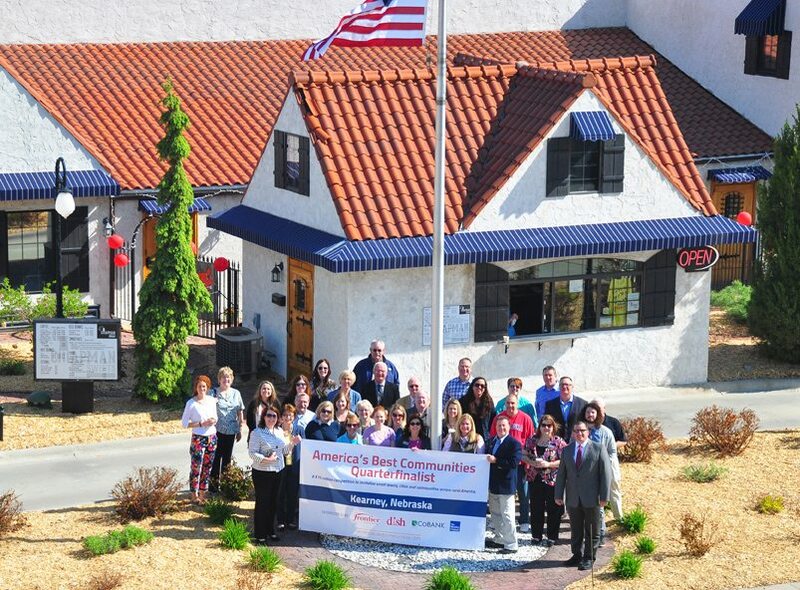 KEARNEY, Neb., April 29, 2015 — Kearney, Nebraska, is celebrating its victory in the first round of the America’s Best Communities competition, a $10 million initiative to stimulate economic revitalization in small towns and cities. Community members met with the planning team to learn about the next steps of the competition and show off Kearney’s victory banner. Frontier Communications, DISH Network, The Weather Channel and CoBank — the contest’s sponsors — today announced Kearney has advanced into the quarterfinals of this innovative competition, following selection from a pool of about 140 applicant teams by an independent group of expert judges. The community will now be awarded $50,000 to develop a comprehensive strategy to accelerate the revival of the local economy and improve quality of life. The competition’s 50 quarterfinalist communities now have six months to complete their revitalization plans for the chance to win up to an additional $3 million to bring their ideas to life. After launching in September 2014, the America’s Best Communities competition successfully attracted entries from 138 applicant teams, representing 347 communities across the country. The 50 quarterfinalist communities have six months to complete their comprehensive Community Revitalization Plans and compete for additional investment. 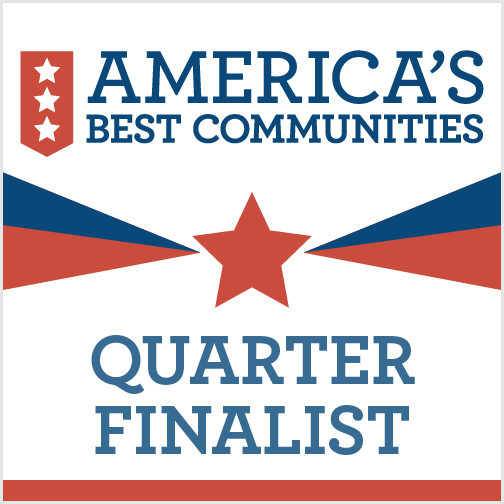 In early 2016, 15 semifinalists will be selected to attend the America’s Best Communities summit to present their strategies and eight finalists will be awarded another $100,000 to continue implementation of their plans. Frontier Communications Corporation (NASDAQ: FTR) offers broadband, voice, video, wireless Internet data access, data security solutions, bundled offerings, specialized bundles for residential customers, small businesses and home offices and advanced communications for medium and large businesses in 28 states. Frontier’s approximately 17,400 employees are based entirely in the United States. More information is available at www.frontier.com. DISH Network Corp. (NASDAQ: DISH), through its subsidiaries, provides approximately 13.978 million pay-TV subscribers, as of Dec. 31, 2014, with the highest-quality programming and technology with the most choices at the best value. Subscribers enjoy a high definition line-up with more than 200 national HD channels, the most international channels, and award-winning HD and DVR technology. DISH Network Corporation is a Fortune 250 company. Visit www.dish.com. CoBank is a $102 billion cooperative bank serving vital industries across rural America. The bank provides loans, leases, export financing and other financial services to agribusinesses and rural power, water and communications providers in all 50 states. The bank also provides financial services to affiliated Farm Credit associations serving farmers, ranchers and other rural borrowers in 23 states around the country. CoBank is a member of the Farm Credit System, a nationwide network of banks and retail lending associations chartered to support the borrowing needs of U.S. agriculture and the nation’s rural economy. Visit www.cobank.com. Through the Weather Channel (weather.com) and Weather Underground (wunderground.com) brands, The Weather Company provides millions of people every day with the world’s best weather forecasts, content and data, connecting with them through television, online, mobile and tablet screens, as well as third-party publishing partners via API. Through WSI, the company delivers superior professional weather services for the media, aviation and energy sectors. For more information, visit www.theweathercompany.com.